Some call it country, some call it roots-and-blues, and others call it rough-around- the-edges folk. 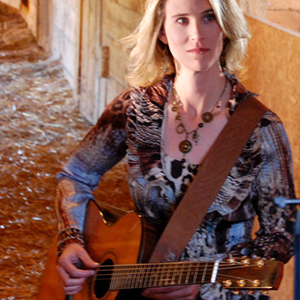 Lynne Hanson calls her music "porch music with a little Texas red dirt." It's a sound that's been receiving applause from enamoured critics and devoted fans in Canada, the US, Europe and Australia, garnering Hanson the 2010 Colleen Peterson Songwriting Award, a 2009 Canadian Folk Music Award nomination, and a place as a finalist in the prestigious 2009 Kerrville Folk Festival New Folk competition. Don't go labelling her a country crooner, but Hanson sure knows how to share her troubles in a song with tales of heartbreak without a hint of sentimentality. Hanson sings simply and honestly about loss and the search for redemption. That redemption comes out at her live shows. No one leaves a Lynne Hanson concert feeling heavy-hearted. Onstage Hanson is a happy-go-lucky storyteller with a gift of gab and a wink in her eye, engaging her audience just as much with her stories and one-liners as she can with her music. She's intimate with her audience as if she's shooting the breeze with old friends at her kitchen table.